Robby experienced a husband’s worst nightmare when his wife collapsed and began having seizures. He and his wife Kathy join The Doctors to share their harrowing story. Watch the video on Yahoo News. While on vacation, Kathy began experiencing severe headaches, then became unresponsive, which was followed by uncontrollable spasms. Initially, the doctors could not determine what was wrong with Kathy, first thinking it was a behavioral issue, but after further testing a brain aneurysm was discovered. Doctors rushed Kathy into surgery to relieve the pressure in her brain, during which time she suffered from a heart attack and a stroke. Due to the severity of Kathy’s condition, she was transferred to another hospital, where neurosurgeons Dr. Bill Mack and Dr. Jonathan Russin performed yet another surgery, one they had only performed a handful of times. Dr. Mack tells ER physician Dr. Travis Stork that Kathy’s case was quite difficult and that only 50 percent of people with this type of aneurysm survive long enough to make it to the hospital and of those 50 percent another half end up disabled. Thankfully, Kathy beat the odds stacked against her and survived the horrendous medical scare. She joins the panel to share her sobering story. “I feel awesome. I feel lucky,” an ecstatic Kathy tells the panel. Not only did she survive, but she is flourishing and still enjoying her love of running. 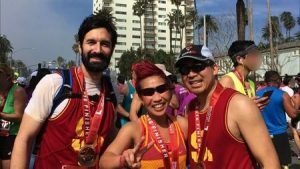 Only 11 months after her life-saving surgery, she ran a marathon alongside Dr. Russin and her husband. Now, Kathy hopes to raise awareness of aneurysms through her love of endurance sports. “Running has always been a platform for me to be able to raise awareness, so I said, let’s try and get some awareness out for brain aneurysm research. To be honest with you, when they told me I had an aneurysm, I didn’t even know what that was,” she shares.